You could say I get around the town. In reality I get around the region and the ones adjacent to it in my role with ARTbop. I see the curated and the catalogued, the beautifully presented and the controlled art spaces but I also gain an insight into our communities from the spontaneous, the ordinary and the detritus. Here are some of the weird, wonderful and unexpected sights I’ve encountered since mid-2017. 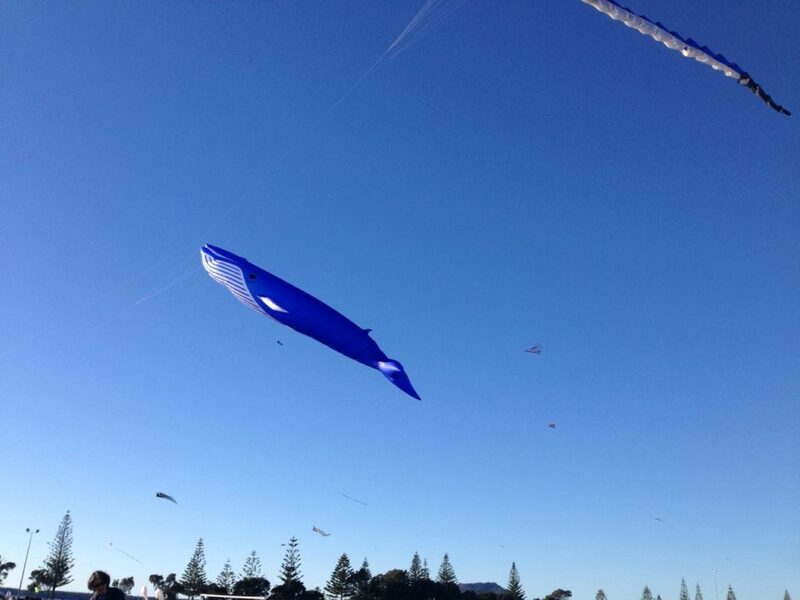 This is one of the very large kites flown at Kite Day down at Ferguson Park, Tauranga in June 2017 – I just loved the idea of the flying whale. 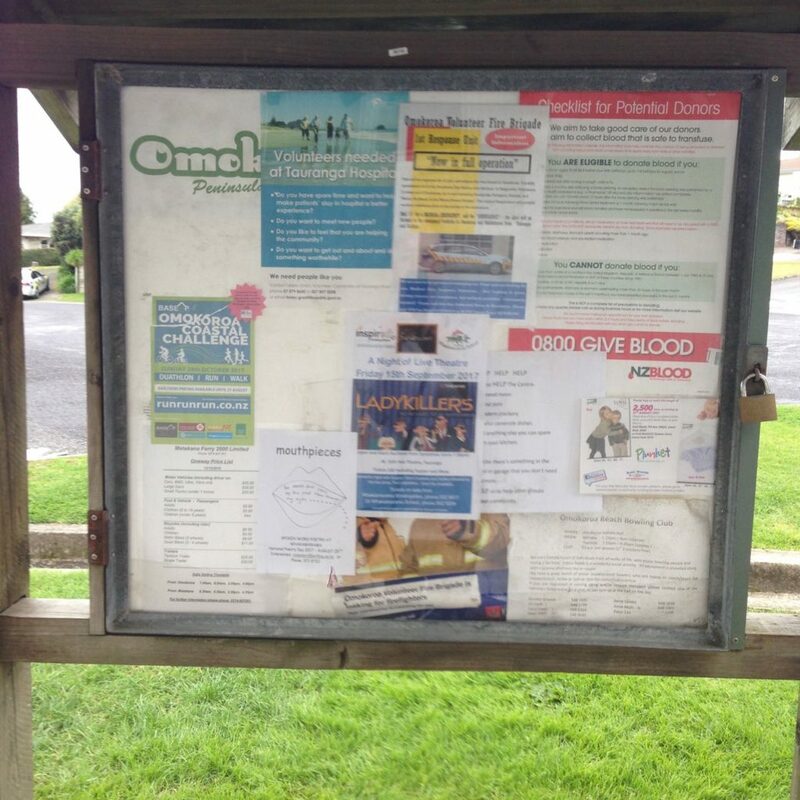 The juxtapostion of the promotional poster for The Ladykillers and the Blood service on this local notice board still amuses me. I feel I should run past its site in case some well-meaning arm tries to capture this old lady for her blood. Parewhati Taikato invited me to a raranga weaving workshop she was leading for Tauranga Hospital Staff. 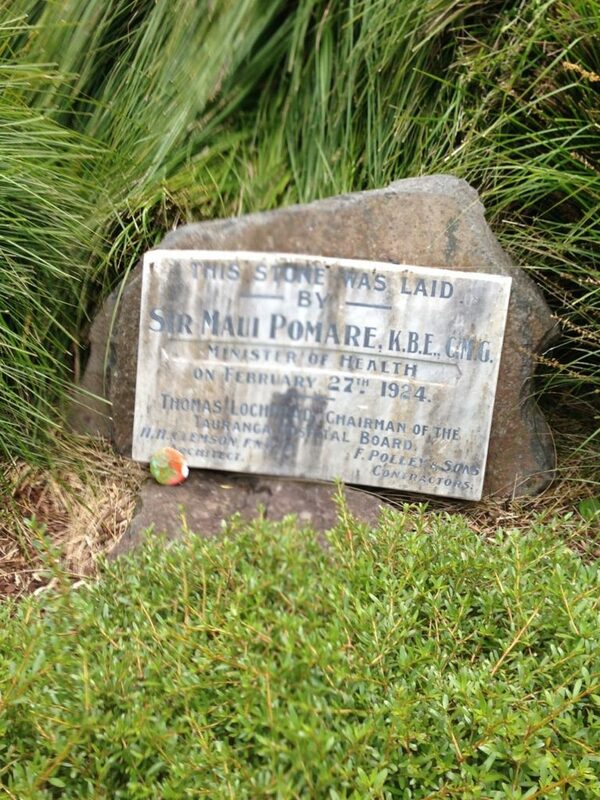 It was on the rooftop garden of one of the buildings and that’s where this marble sign is. Who knew this garden existed – not me. 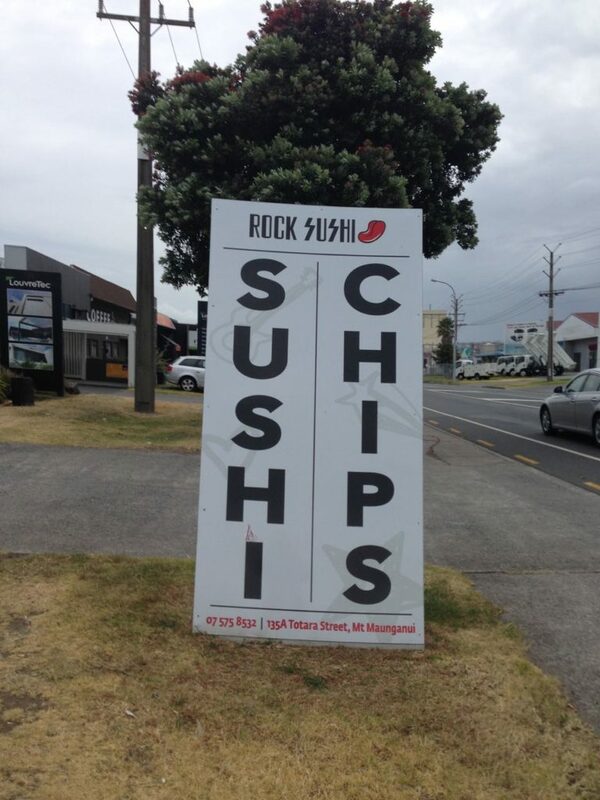 One of the busiest places in Tauranga is Bobby’s Fish and Chip Shop down on Dive Crescent in Downtown Tauranga. I went to the Arts Festival opening event led by Ria Hall early one morning – it’s the only time I’ve ever seen Bobby’s quiet. 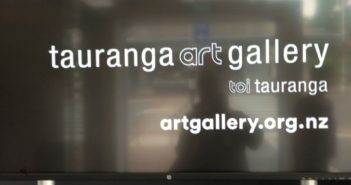 If you’re down in Tauranga a visit here is almost a must. 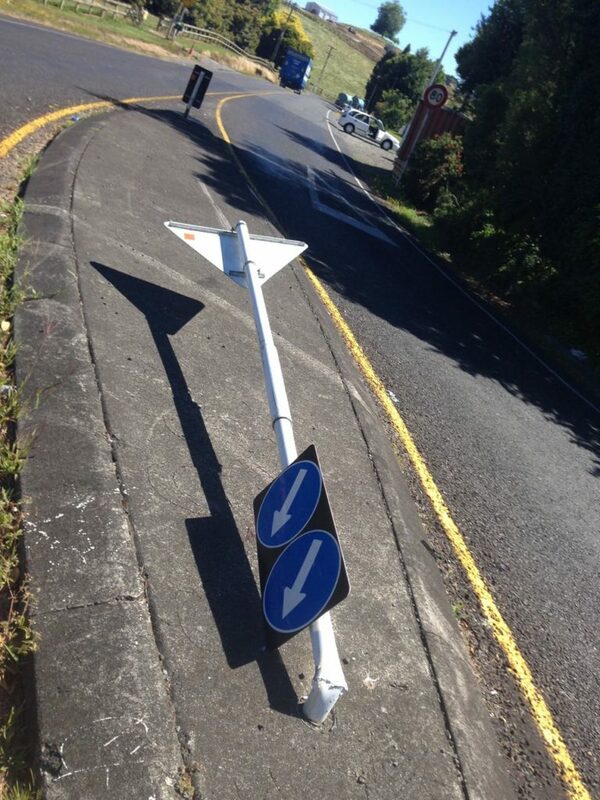 I was walking along Cameron Road with Auckland poet John Adams and his wife Usha Patel heading for the Elzabeth Street cafe when I found this in my pathway – the other one was some distance ahead of it. 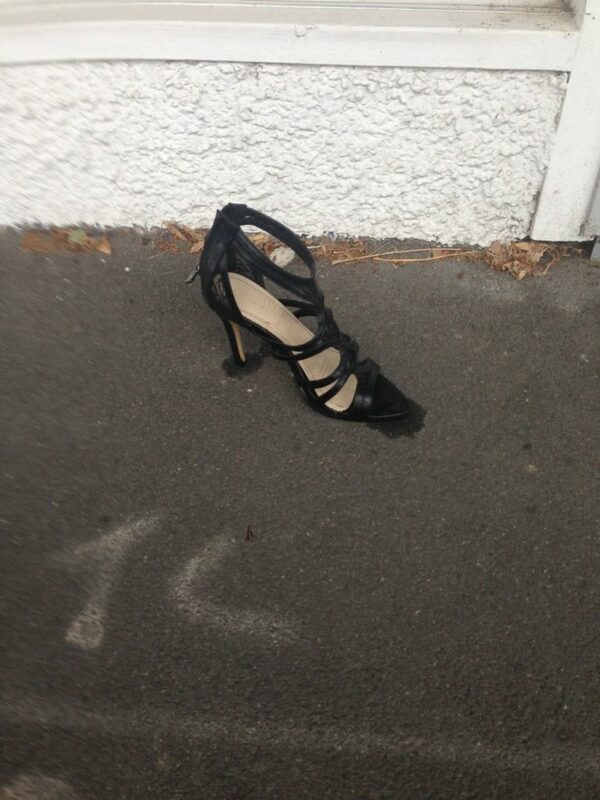 They’re not the only abandoned shoes I’ve found around the town – so many in fact I was thinking of a specifically themed album. 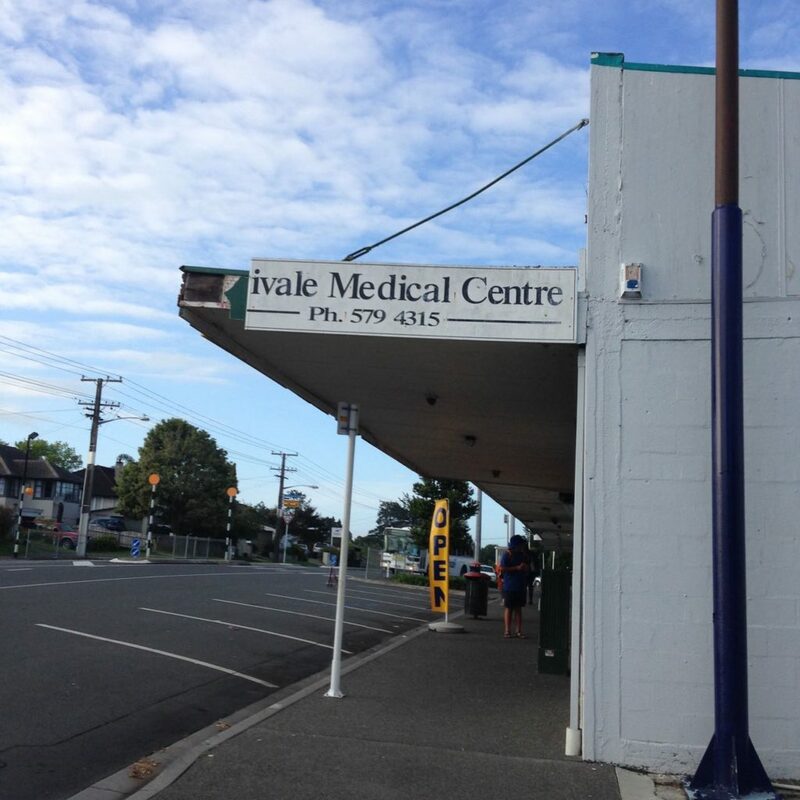 I’m not sure I’d be going to see Dr Ivale Isn’t this an amazing sight and an amazing site. A contained and movable exhibition. 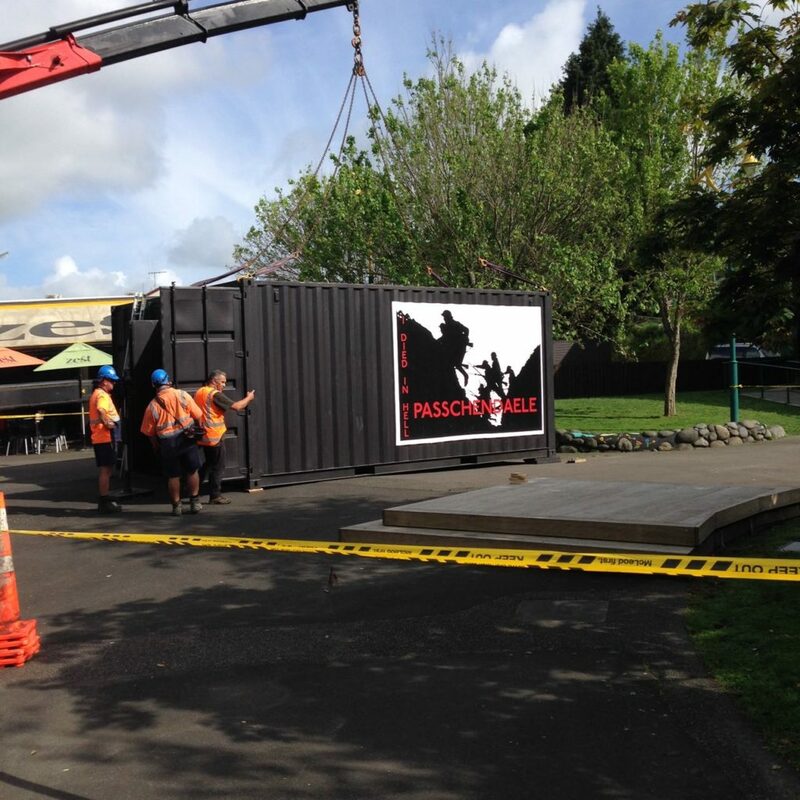 I watched as this team lovingly placed the container and its contents into the Greerton Village Square. I’m down at the Incubator in the Historic Village, Tauranga on a regular basis. I’ve watched it develop and seen all the hard work and energy which has gone into its rise as a community arts centre and educative hub. My trigger finger must have twitched and provided me with this inspiring shot from an exhibition opening. 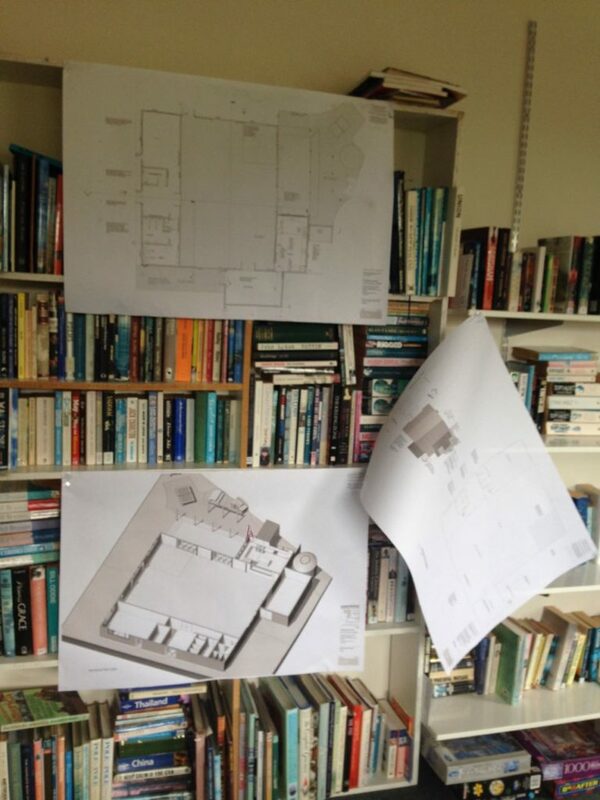 Our district hall was consulting with the community – the plans had other ideas. I couldn’t work out what they were trying to kill off. Fortunately it wasn’t the tree. This wasn’t the only sign displayed down on the Omokora Waterfront the day I was down there – good that we have signs, bad that we have to do this – it was for the weeds around the base of the tree. Once of the absolute highlights of my time in Tauranga has been being invited to a family dinner at the Mount Bistro by a particularly talented and staunch young woman. It was one of those privileges and treats you remember all your life. 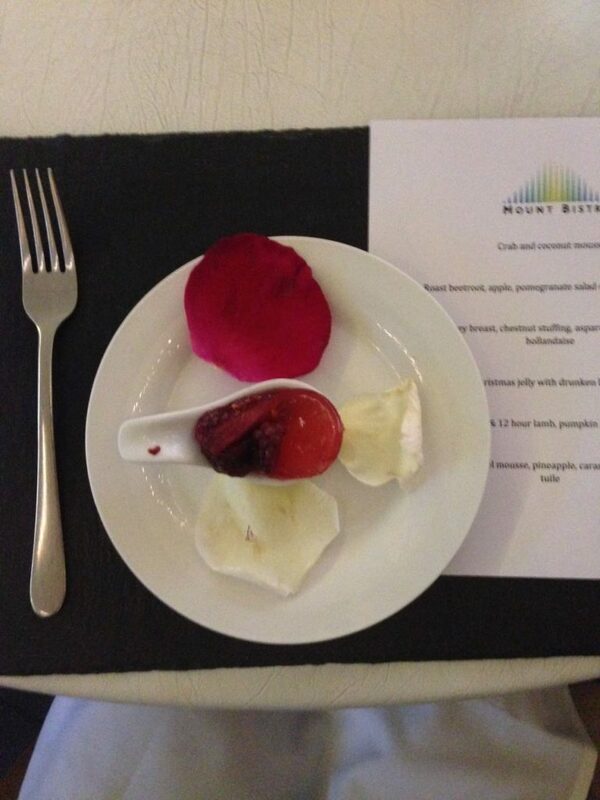 It was sheer culinary artistry. This composition was a palette cleanser I have absolutely no idea what these tiny blue squares are or where they were from. 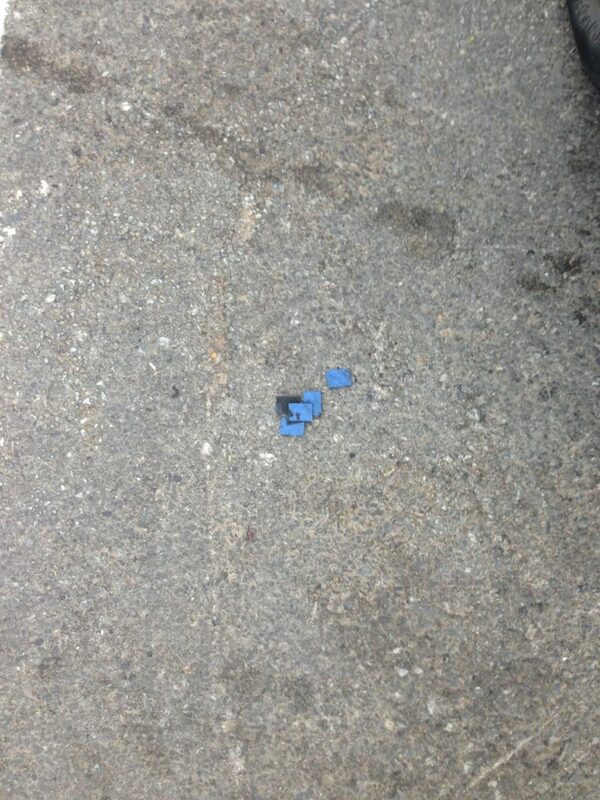 This small collage was assembled on the stones by my car – it’s the kind of unexpected surprise I love. 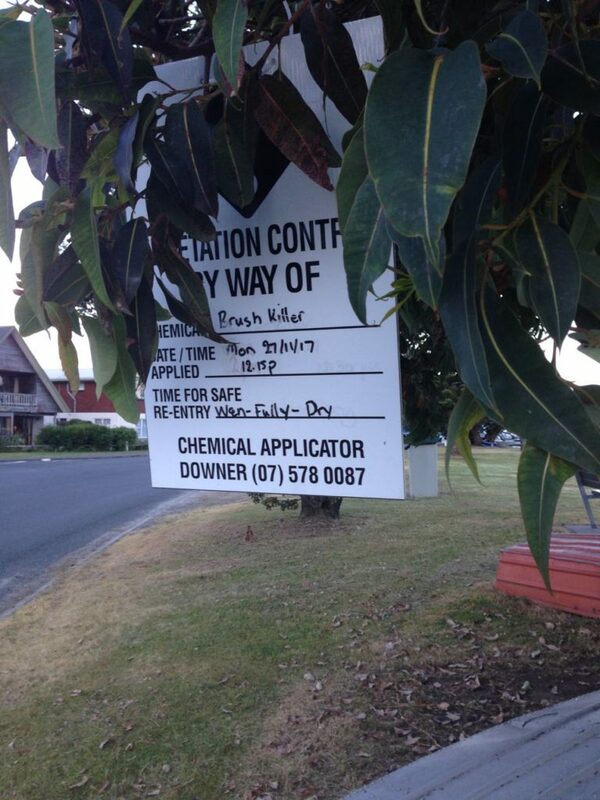 I always crack up when I drive past this sign – a hymn to integration. One of my favourite treats on a busy day doing the Affordable Art & Artisan Fair poster printing and the ARTbop copying at the WSL at The Crossing is to call by the sushi shop for some sushi and miso soup. Yes, I always have spring onions. 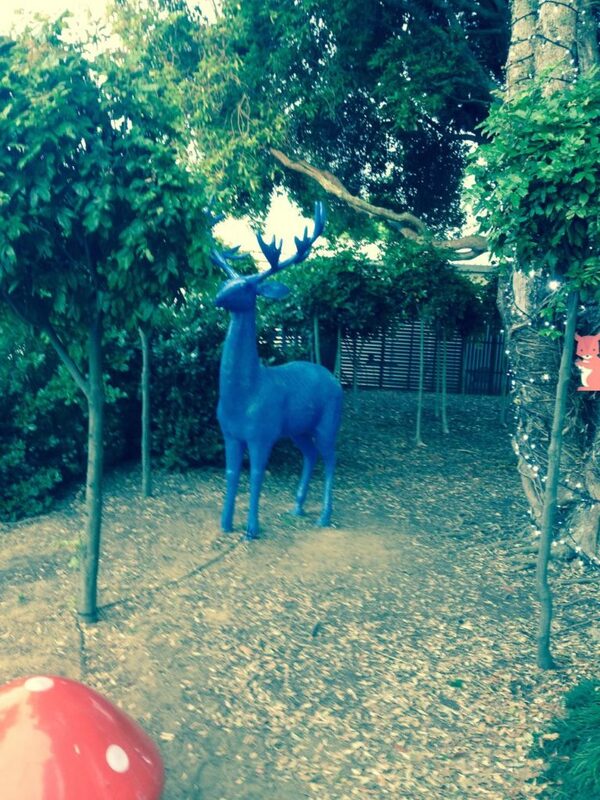 The traditional Christmas animals in “the grotto” at the Bethlehem Town Centre are an eye-catching blue and shiny purple. 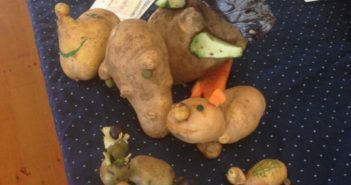 I so wanted to deride them but I was told young children just love them, the plastic spotted toadstools and the gnomes. 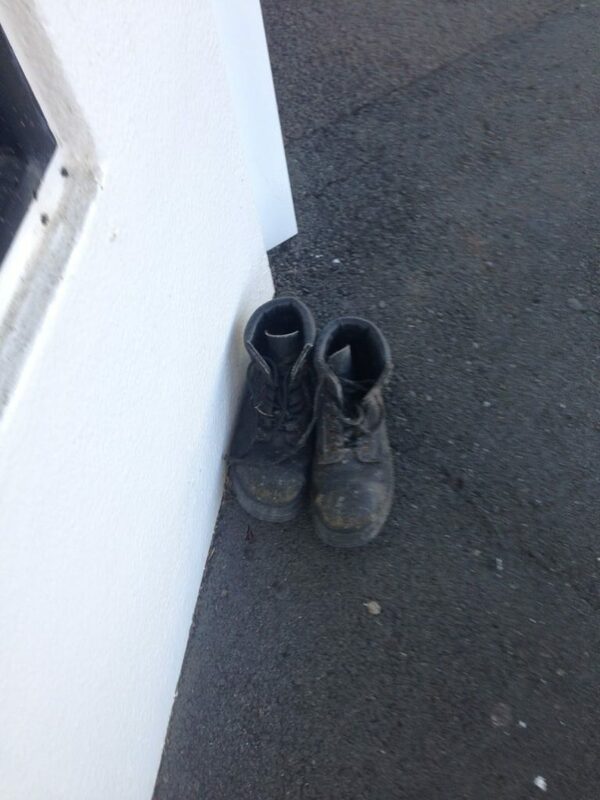 I’m hoping the owner of these boots was somewhere inside the building. 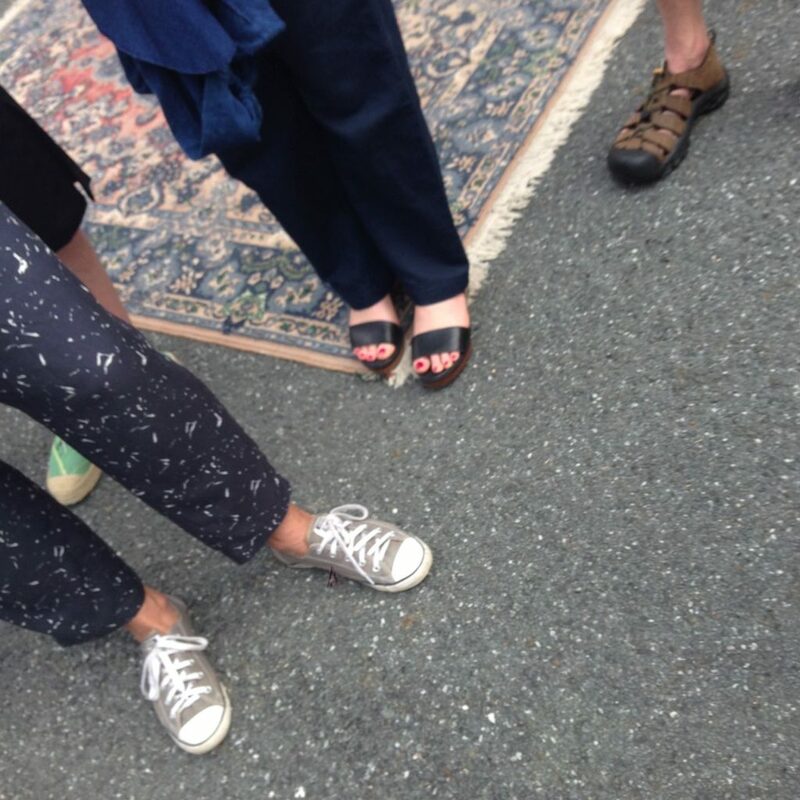 I think I took this image because the circumstances suggested he may have gone home sans footwear. There are occasions when it’s not only wise but necessary to take no notice of the road signs. 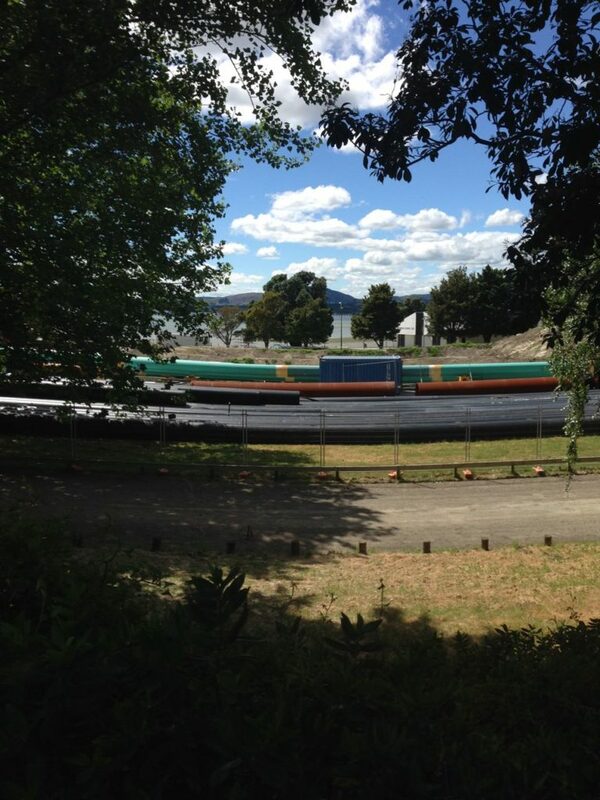 This is a scenic view of the sewage pipes waiting to be installed in the park and across the harbour. 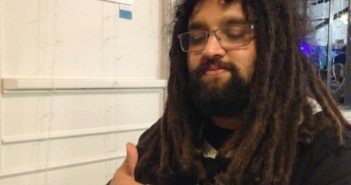 Kai Aroha and the extended Lewis-Rickard Family represent positive human community initiative. 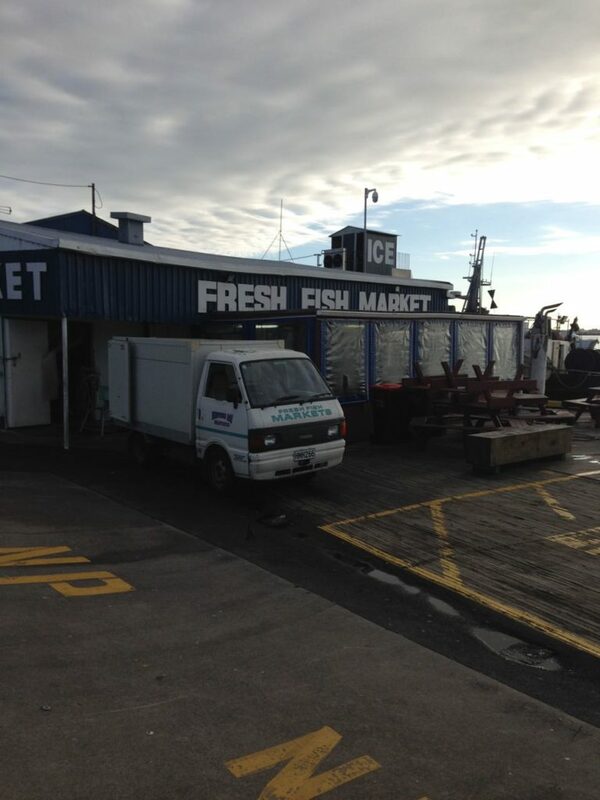 They are one of the independently started and run community food and support services in Tauranga. (They are also part of a new initiative to build a night shelter for women.) 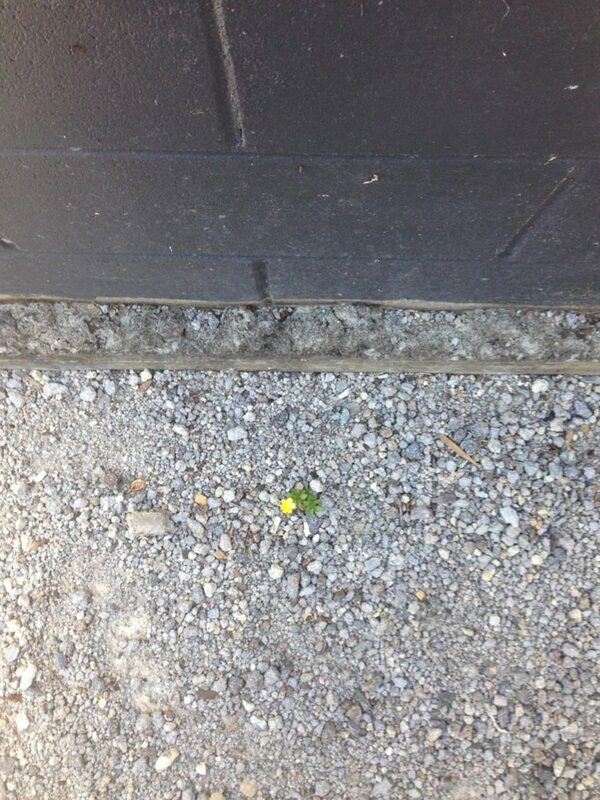 And that little yellow flower. 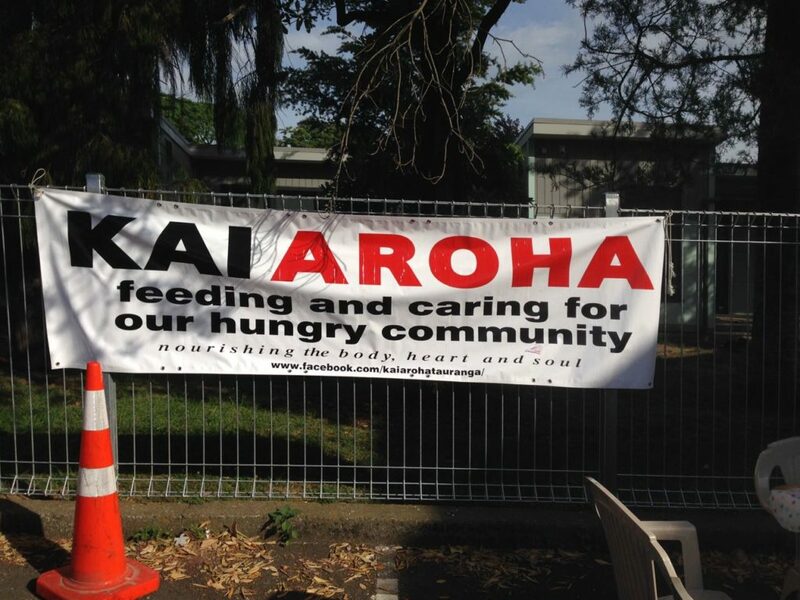 Last year I was invited to see what happens at the Kai Aroha Christmas dinner (I was actually invited to dinner but felt it inappropriate to take food donated for those struggling against the tide). As I was leaving what in it’s undecorated, non-Christmas role is the courtyard of the Anglican Church op-shop,I noticed the flower like all these organisations, had the ability to grow on stony ground. There are no Christmas decorations outside my house – today it has poured with rain. The wind has knocked over the tomato plant containers and on the first day of Summer 2018 I have a fire in the sitting room and a heater on at the other end of the house. Hopefully tomorrow it will remember what time of the year this is supposed to be. So we don’t seem entirely unseasonal and miserable The Nukes have given us a double pass to their 9th December show at the Incubator to give away: Check it out below! On the 9th December 2018 The Incubator at the Historic Village 17th Avenue Tauranga is hosting The Nukes for both a workshop and a concert – sharing with you the promo info sent by them AND IF YOU WOULD LIKE TO WIN A DOUBLE PASS TO THEIR SHOW TELL US WHAT INSTRUMENT WILL BE FEATURED AT THE NUKES WORKSHOP AT THE INCUBATOR! 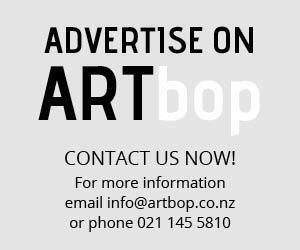 EMAIL ARTbop YOUR ANSWER (head your email THE NUKES GIVEAWAY) TO: info@artbop.co.nz and go in the draw. Competition closes on the 7th December at 8pm. 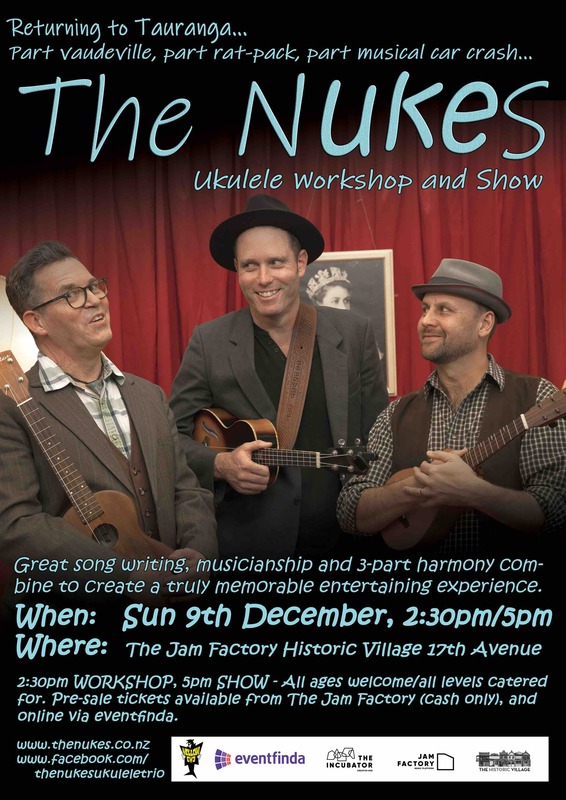 Sunday Dec 9th sees the Nukes return to Tauranga with a 2.30 pm workshop for ukulele. There’s something for everyone in this blisteringly good new Nukes ukulele workshop. 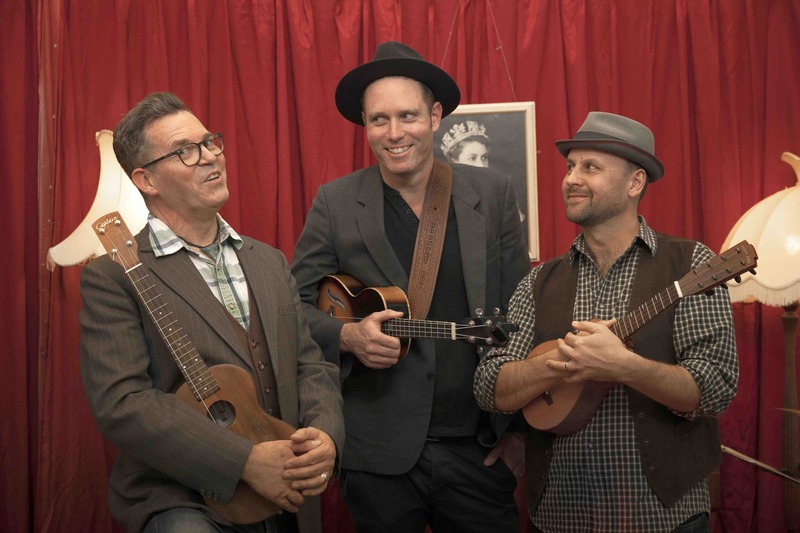 Proud of their quirky original songs – all written for the ukulele, the Nukes’ workshops are always engaging and fun. They will cover techniques, such as tab, and look at the playing skills that are useful for improving understanding of the ukulele , the workshop will look at new songs and old. No matter what your skill level you’ll take something useful away. Over the last five years we have performed at something like 300 public shows , events and a further 200 primary schools where we have a specific ukulele – singing -dancing workshop where the kids get to perform with us at the all school show that follows …some 65000 pre teen kids have been performed to .Our three albums and songbook have physically sold platinum for New Zealand which is about 7500 units with sales continuing as we spread our ukes about Australasia. Celebrating their tenth anniversary this year with an upcoming Greatest Hits cd and songbook for March 2019 release . Appearances at WOMAD NZ , SPLORE NZ ( multiple times ) , Auckland and Canterbury Folk Festivals , New Plymouth Festival Of Light 2018 , Wanaka Festival Of Colour 2017 , Coastella Festival 2017 , Southland Festival Of Arts 2017 , Bluff Oyster Festival , Arts On Tour NZ March 2017 -35 shows over five weeks , NZ Schools ukulele festival (multiple times ), Geraldine Ukulele Festival 2016, Egmont AnP show , Mackenzie Country AnP show and to come in 2018 Hawkes Bay Arts Festival , Oamaru Heritage Festival and Alexandra Blossom Festival . Australia – Australian Music week Folk Alliance showcase Nov 2017 , Spruke Festival Brisbane , Newcastle ukulele festival ( multiple times ) Central Coast ukulele festival ( multiple times ) Melbourne ukulele festival and Sunshine Coast ukulele Festival April 2018 . Australian Tour Nov 2017 16 shows across 3 weeks. 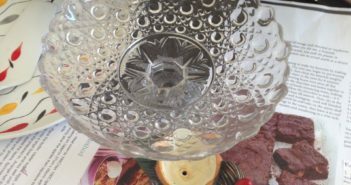 Previous ArticleComing Up: a few little treats and competition for tickets! State Highway 2: all quiet on the western front…?